Not sure what ski or snowboard level you or your family are? We know how important it is to ensure you’re in the right level lesson, so we’ve created a few handy level guides to help you. Check out our adult ski, children’s ski, and a snowboard level guides and videos to find your level. Then, we’ll guide you to the best lesson or course options for you, so you can get the most out of your week with us. And if you still feel stuck, our customer service team is on hand to help year-round. Just get in touch with them. 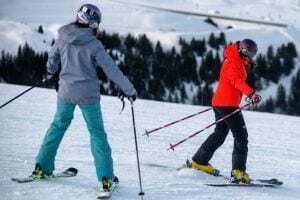 Read our detailed ski level guide and watch our videos to decide what level you are from Level 1 (total beginner) to Level 6 (total pro). We run a whole range of lessons for children’s from our 4yr old Whippersnappers to all-mountain Pro Rider teens. Check out our videos to find out which group your child fits into. Read our snowboard level guide to find out what level you are from Level 1 (beginner) to Level 5 (all-mountain warrior).